Come see me spin to the musical stylings of my close friend and folk singer/songwriter extraordinare, Dawn Xiana Moon, at Martyrs’ Restaurant & Pub in north central Lakeview. Dawn will be playing with her trio and if you haven’t heard her before, you’re in for a treat. 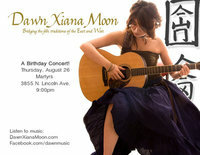 Her music is a unique blend of jazz, blues and even Chinese folk music (with a smattering of French for good measure). It’s not unusual for her to sing in three different languages over the course of one evening. Also, it’s her birthday and she’s providing treats! So come out and join the celebration as she shares what she loves doing most. She’ll be followed by Ben Keeler & the 500 Club (10pm) and 3 in Counting (11pm). Tickets are $7 in advance or at the door. Powered by WordPress. Current Theme: The Scenery.